LEGO’s 369-piece Hayabusa asteroid spacecraft is the only the second fan-made model to be produced as a commercial LEGO building set through the Danish company’s CUUSOO website. The world's first spacecraft to collect samples from the surface of an asteroid and return them to Earth, Japan's Hayabusa mission probe, is now available as a LEGO toy thanks to a homemade model and its thousands of fans. The Denmark-based LEGO Group announced today (March 2) that its Hayabusa 369-piece building set is now on sale in Japan. A limited number of the sets will be made available worldwide exclusively through LEGO's online store at a date to be decided for later this year. The model retails for $49. The LEGO asteroid probe began as a fan-made model that was then posted to the LEGO CUUSOO website. Originally limited to Japan, LEGO CUUSOO allows fans of LEGO to share their ideas for new products and to collect votes to make those ideas become a reality. The site went global last October. "I was interested in the asteroid explorer Hayabusa first from a technological perspective but then also by the fact that Japan had achieved a world first with this mission," Okubo said in a note included with the model's building instructions. "I hope the Hayabusa story will reach an even greater number of people now." Okubo's Hayabusa recreated in LEGO many of the real spacecraft's details. The set includes the sampler horn, which guided particles from the asteroid's surface into the main body of the probe; the ion engine that propelled Hayabusa through space; and the sample return capsule, the only part that returned to Earth. Not all the spacecraft's features were possible, though. "Trying to recreate a real-life object such as the Hayabusa spacecraft in LEGO bricks can also be difficult," Caddick writes in the building guide, which also gives information about the real mission. "For example, with the elements we have available, it was not possible to make the solar panels fold together and then fold down at the sides. We also needed to ensure stability so that when you build the model, it will maintain its shape as much as possible." One detail that is included with the model was crucial to the Hayabusa mission's success. Japan Aerospace Exploration Agency (JAXA) project manager Junichiro Kawaguchi is included with the toy as a LEGO Minifigure. Clad in a blue pinstripe suit and yellow tie, the miniature Kawaguchi features two faces: an everything-is-going-well-with-the-mission happy face, as well as a more disturbed look for the high-tension moments that came during Hayabusa's mission. 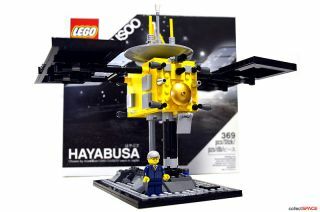 LEGO’s Hayabusa asteroid spacecraft went on sale in Japan on Friday, March 2, 2012. A limited number of the sets will be offered worldwide through the company’s website later this year. The real Hayabusa launched in May 2003 and reached asteroid Itokawa two years later. First orbiting the small near-Earth asteroid, Hayabusa collected data about the shape, spin, topography, color, composition, density and history of the rocky planetoid. In November 2005, it landed on Itokawa and collected samples in the form of tiny grains of asteroid material, which were returned to Earth aboard the spacecraft in June 2010. The LEGO Hayabusa model is the second CUUSOO model to be produced out of the three chosen to date. The first, the Shinkai 6500 submarine, went on sale in Japan in February 2011. A set based on the computer game Minecraft is the first user-sponsored project to be approved on the global version of LEGO CUUSOO. In its current version, ideas shared on the CUUSOO website supported by 10,000 votes are examined by a LEGO jury to ensure the models meet the company's standards of safety and playability and support the LEGO brand. Consumers who have their ideas chosen for production earn one percent of the total net sales of the product. See collectSPACE.com for more photographs of LEGO's Hayabusa asteroid spacecraft model.